A Lightweight & Backup single pan single basket Fryer by Lincat finished in stainless steel. 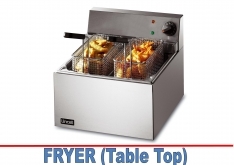 Comes complete with 4 litre capacity, lift out pan, easy clean, full temperature control, cook & ready lights, surdy basket, removable control head, batter plate and full thermostatic control. W270xD400xH315mm. 3kw plug top.